A smaller version of the 1st crop circle formation reported on Jan 23rd in Rejosari Village, Yogyakarta was reported on January 25th 2011 in Bantul Wanujoyo, Yogyakarta Java Indonesia. Basically these two crop circles appeared in Indonesia are like twins. 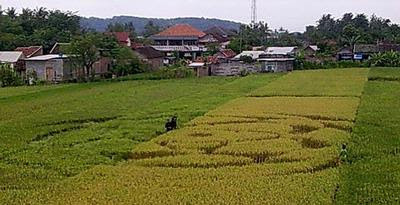 With Yogyakarta, Java being the centre, the first crop circle is located to its North and the second one is located to the South. In 2008 and 2009 several UFOs were seen in Bantul and in the surroundings. It is possible too that they are showing us the the Magnetic Fields are moving through all over the world and it is possible that this part of the globe is influenced by this phenomenon. Orb Photography : Manifesting Love, Spiritually !